These highlights do not include all the information needed to use BANZEL ® safely and effectively. See full prescribing information for BANZEL ® . To report SUSPECTED ADVERSE REACTIONS, contact Eisai, Inc. at 1-888-274-2378 or www.banzel.com or FDA at 1-800-FDA-1088 or www.fda.gov/medwatch. The recommended starting daily dose of BANZEL in pediatric patients with Lennox-Gastaut Syndrome is approximately 10 mg/kg administered in two equally divided doses. The dose should be increased by approximately 10 mg/kg increments every other day until a maximum daily dose of 45 mg/kg, not to exceed 3200 mg, administered in two equally divided doses, is reached. It is not known whether doses lower than the target doses are effective. The recommended starting daily dose of BANZEL in adults with Lennox-Gastaut Syndrome is 400 to 800 mg per day administered in two equally divided doses. The dose should be increased by 400-800 mg every other day until a maximum daily dose of 3200 mg, administered in two equally divided doses, is reached. It is not known whether doses lower than 3200 mg are effective. Administer BANZEL with food. BANZEL film-coated tablets can be administered whole, as half tablets or crushed. BANZEL oral suspension should be shaken well before every administration. 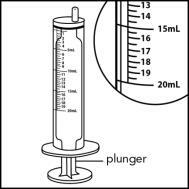 The provided adapter and calibrated oral dosing syringe should be used to administer the oral suspension. The adapter which is supplied in the product carton should be inserted firmly into the neck of the bottle before use and remain in place for the duration of the usage of the bottle. 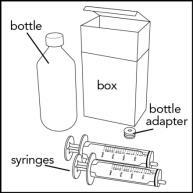 The dosing syringe should be inserted into the adapter and the dose withdrawn from the inverted bottle. The cap should be replaced after each use. The cap fits properly when the adapter is in place [see Patient Counseling Information (17)]. Hemodialysis may reduce exposure to a limited (about 30%) extent. Accordingly, adjusting the BANZEL dose during the dialysis process should be considered [see Clinical Pharmacology (12.3)]. Use of BANZEL in patients with hepatic impairment has not been studied. Therefore, use in patients with severe hepatic impairment is not recommended. Caution should be exercised in treating patients with mild to moderate hepatic impairment [see Use in Specific Populations (8.7)]. Patients taking valproate should begin BANZEL at a dose lower than 10 mg/kg per day in pediatric patients or 400 mg per day in adults [see Drug Interactions (7.2)]. Film-coated Tablets: 200 mg (pink) and 400 mg (pink). Tablets are scored on both sides. BANZEL is contraindicated in patients with Familial Short QT syndrome [see Warnings and Precautions (5.3)]. Antiepileptic drugs (AEDs), including BANZEL, increase the risk of suicidal thoughts or behavior in patients taking these drugs for any indication. Patients treated with any AED for any indication should be monitored for the emergence or worsening of depression, suicidal thoughts or behavior, and/or any unusual changes in mood or behavior. Anyone considering prescribing BANZEL or any other AED must balance the risk of suicidal thoughts or behavior with the risk of untreated illness. Epilepsy and many other illnesses for which AEDs are prescribed are themselves associated with morbidity and mortality and an increased risk of suicidal thoughts and behavior. Should suicidal thoughts and behavior emerge during treatment, consider whether the emergence of these symptoms in any given patient may be related to the illness being treated. Use of BANZEL has been associated with central nervous system-related adverse reactions in the controlled clinical trial of patients 4 years or older with Lennox-Gastaut Syndrome. The most significant of these can be classified into two general categories: 1) somnolence or fatigue, and 2) coordination abnormalities, dizziness, gait disturbances, and ataxia. Somnolence was reported in 24% of BANZEL-treated patients compared to 13% of patients on placebo, and led to study discontinuation in 3% of BANZEL-treated patients compared to 0% of patients on placebo. Fatigue was reported in 10% of BANZEL-treated patients compared to 8% of patients on placebo patients. It led to study discontinuation in 1% of BANZEL-treated patients and 0% of patients on placebo patients. Dizziness was reported in 2.7% of BANZEL-treated patients compared to 0% of patients on placebo, and did not lead to study discontinuation. Ataxia and gait disturbance were reported in 5.4% and 1.4% of BANZEL-treated patients, respectively, compared to no patient on placebo. None of these reactions led to study discontinuation. Accordingly, patients should be advised not to drive or operate machinery until they have gained sufficient experience on BANZEL to gauge whether it adversely affects their ability to drive or operate machinery. Formal cardiac ECG studies demonstrated shortening of the QT interval (mean = 20 msec, for doses >2400 mg twice daily) with BANZEL. In a placebo-controlled study of the QT interval, a higher percentage of BANZEL-treated subjects (46% at 2400 mg, 46% at 3200 mg, and 65% at 4800 mg) had a QT shortening of greater than 20 msec at Tmax compared to placebo (5-10%). Reductions of the QT interval below 300 msec were not observed in the formal QT studies with doses up to 7200 mg per day. Moreover, there was no signal for drug-induced sudden death or ventricular arrhythmias. The degree of QT shortening induced by BANZEL is without any known clinical risk. Familial Short QT syndrome is associated with an increased risk of sudden death and ventricular arrhythmias, particularly ventricular fibrillation. Such events in this syndrome are believed to occur primarily when the corrected QT interval falls below 300 msec. Non-clinical data also indicate that QT shortening is associated with ventricular fibrillation. Patients with Familial Short QT syndrome should not be treated with BANZEL. Caution should be used when administering BANZEL with other drugs that shorten the QT interval [see Contraindications (4)]. Drug Reaction with Eosinophilia and Systemic Symptoms (DRESS), also known as multi-organ hypersensitivity, has been reported in patients taking antiepileptic drugs, including BANZEL. DRESS may be fatal or life-threatening. DRESS typically, although not exclusively, presents with fever, rash, and/or lymphadenopathy, in association with other organ system involvement, such as hepatitis, nephritis, hematological abnormalities, myocarditis, or myositis, sometimes resembling an acute viral infection. Eosinophilia is often present. It is important to note that early manifestations of hypersensitivity, such as fever or lymphadenopathy, may be present even though rash is not evident. Because this disorder is variable in its expression, other organ systems not noted here may be involved. All cases of DRESS identified in clinical trials with BANZEL occurred in pediatric patients less than 12 years of age, occurred within 4 weeks of treatment initiation, and resolved or improved with BANZEL discontinuation. DRESS has also been reported in adult and pediatric patients taking BANZEL in the postmarketing setting. If DRESS is suspected, the patient should be evaluated immediately, BANZEL should be discontinued, and alternative treatment should be started. As with all antiepileptic drugs, BANZEL should be withdrawn gradually to minimize the risk of precipitating seizures, seizure exacerbation, or status epilepticus. If abrupt discontinuation of the drug is medically necessary, the transition to another AED should be made under close medical supervision. In clinical trials, BANZEL discontinuation was achieved by reducing the dose by approximately 25% every 2 days. Estimates of the incidence of treatment emergent status epilepticus among patients treated with BANZEL are difficult because standard definitions were not employed. In a controlled Lennox-Gastaut Syndrome trial, 3 of 74 (4.1%) BANZEL-treated patients had episodes that could be described as status epilepticus in the BANZEL-treated patients compared with none of the 64 patients in the placebo-treated patients. In all controlled trials that included patients with different epilepsies, 11 of 1240 (0.9%) BANZEL-treated patients had episodes that could be described as status epilepticus compared with none of 635 patients in the placebo-treated patients. BANZEL has been shown to reduce white cell count. Leukopenia (white cell count < 3X109 L) was more commonly observed in BANZEL-treated patients 43 of 1171 (3.7%) than placebo-treated patients, 7 of 579 (1.2%) in all controlled trials. In the pooled, double-blind, adjunctive therapy studies in adult and pediatric patients ages 3 to 17 years of age, the most common (≥10%) adverse reactions in BANZEL-treated patients, in all doses studied (200 to 3200 mg per day) with a higher frequency than in patients on placebo were: headache, dizziness, fatigue, somnolence, and nausea. Table 2 lists adverse reactions that occurred in at least 3% of pediatric patients (ages 3 to less than 17 years) with epilepsy treated with BANZEL in controlled adjunctive studies and were numerically more common in patients treated with BANZEL than in patients on placebo. At the target dose of 45 mg/kg per day for adjunctive therapy in pediatric patients (ages 3 to less than 17 years), the most common (≥3%) adverse reactions with an incidence greater than in placebo for BANZEL were somnolence, vomiting, and headache. Table 3 lists adverse reactions that occurred in at least 3% of adult patients with epilepsy treated with BANZEL (up to 3200 mg per day) in adjunctive controlled studies and were numerically more common in patients treated with BANZEL than in patients on placebo. In these studies, either BANZEL or placebo was added to the current AED therapy. At all doses studied of up to 3200 mg per day given as adjunctive therapy in adults, the most common (≥ 3%) adverse reactions, and with the greatest increase in incidence compared to placebo, for BANZEL were dizziness, fatigue, nausea, diplopia, vision blurred, and ataxia. In controlled, double-blind, adjunctive clinical studies, 9% of pediatric and adult patients receiving BANZEL as adjunctive therapy and 4% receiving placebo discontinued as a result of an adverse reaction. The adverse reactions most commonly leading to discontinuation of BANZEL (>1%) used as adjunctive therapy were generally similar in adults and pediatric patients. In pediatric patients (ages 4 to less than 17 years) double-blind adjunctive clinical studies, 8% of patients receiving BANZEL as adjunctive therapy (at the recommended dose of 45 mg/kg per day) and 2% receiving placebo discontinued as a result of an adverse reaction. The adverse reactions most commonly leading to discontinuation of BANZEL (>1%) used as adjunctive therapy are presented in Table 4. In adult double-blind, adjunctive clinical studies, 10% of patients receiving BANZEL as adjunctive therapy (at doses up to 3200 mg per day) and 6% receiving placebo discontinued as a result of an adverse reaction. The adverse reactions most commonly leading to discontinuation of BANZEL (>1%) used as adjunctive therapy are presented in Table 5. In a multicenter, parallel group, open-label study comparing BANZEL (45 mg/kg per day) adjunctive treatment (n=25) to the adjunctive treatment with an AED of the investigator’s choice (n=11) in pediatric patients (1 year to less than 4 years of age) with inadequately controlled Lennox-Gastaut Syndrome, the adverse reaction profile was generally similar to that observed in adults and pediatric patients 4 years of age and older treated with BANZEL. Adverse reactions that occurred in at least 2 (8 %) BANZEL-treated patients and with a higher frequency than in the AED comparator group were: vomiting (24%), somnolence (16%), bronchitis (12%), constipation (12%), cough (12%), decreased appetite (12%), rash (12%), otitis media (8%), pneumonia (8%), decreased weight (8%), gastroenteritis (8%), nasal congestion (8%), and pneumonia aspiration (8%). BANZEL has been administered to 1978 individuals during all epilepsy clinical trials (placebo-controlled and open-label). Adverse reactions occurring during these studies were recorded by the investigators using terminology of their own choosing. To provide a meaningful estimate of the proportion of patients having adverse reactions, these events were grouped into standardized categories using the MedDRA dictionary. Adverse events occurring at least three times and considered possibly related to treatment are included in the System Organ Class listings below. Terms not included in the listings are those already included in the tables above, those too general to be informative, those related to procedures, and terms describing events common in the population. Some events occurring fewer than 3 times are also included based on their medical significance. Because the reports include events observed in open-label, uncontrolled observations, the role of BANZEL in their causation cannot be reliably determined. Events are classified by body system and listed in order of decreasing frequency as follows: frequent adverse events—those occurring in at least 1/100 patients; infrequent adverse events—those occurring in 1/100 to 1/1000 patients; rare—those occurring in fewer than 1/1000 patients. Blood and Lymphatic System Disorders: Frequent: anemia. Infrequent: lymphadenopathy, leukopenia, neutropenia, iron deficiency anemia, thrombocytopenia. The following adverse reactions have been identified during post approval use of BANZEL. Because these reactions are reported voluntarily from a population of uncertain size, it is not always possible to reliably estimate their frequency or establish a causal relationship to drug exposure. Dermatologic: Stevens-Johnson syndrome and other serious skin rashes with mucosal involvement. Population pharmacokinetic analysis of average concentration at steady state of carbamazepine, lamotrigine, phenobarbital, phenytoin, topiramate, and valproate showed that typical rufinamide Cavss levels had little effect on the pharmacokinetics of other AEDs. Any effects, when they occur, have been more marked in the pediatric population. Table 6 summarizes the drug-drug interactions of BANZEL with other AEDs. a) Predictions are based on BANZEL concentrations at the maximum recommended dose of BANZEL. b) Maximum changes predicted to be in pediatric patients and in adult patients who achieve significantly higher levels of BANZEL, as the effect of rufinamide on these AEDs is concentration-dependent. c) Larger effects in pediatric patients at high doses/concentrations of AEDs. d) Phenobarbital, primidone and phenytoin were treated as a single covariate (phenobarbital-type inducers) to examine the effect of these agents on BANZEL clearance. e) All compounds of the benzodiazepine class were pooled to examine for ‘class effect’ on BANZEL clearance. Phenytoin: The decrease in clearance of phenytoin estimated at typical levels of rufinamide (Cavss 15 μg/mL) is predicted to increase plasma levels of phenytoin by 7 to 21%. As phenytoin is known to have non-linear pharmacokinetics (clearance becomes saturated at higher doses), it is possible that exposure will be greater than the model prediction. Potent cytochrome P450 enzyme inducers, such as carbamazepine, phenytoin, primidone, and phenobarbital, appear to increase the clearance of BANZEL (see Table 6). Given that the majority of clearance of BANZEL is via a non-CYP-dependent route, the observed decreases in blood levels seen with carbamazepine, phenytoin, phenobarbital, and primidone are unlikely to be entirely attributable to induction of a P450 enzyme. Other factors explaining this interaction are not understood. Any effects, where they occurred, were likely to be more marked in the pediatric population. Patients stabilized on BANZEL before being prescribed valproate should begin valproate therapy at a low dose, and titrate to a clinically effective dose. Similarly, patients on valproate should begin at a BANZEL dose lower than 10 mg/kg per day (pediatric patients) or 400 mg per day (adults) [see Dosage and Administration (2.5), Clinical Pharmacology (12.3)]. Female patients of childbearing age should be warned that the concurrent use of BANZEL with hormonal contraceptives may render this method of contraception less effective. Additional non-hormonal forms of contraception are recommended when using BANZEL [see Clinical Pharmacology (12.3) and Patient Counseling Information (17)]. There are no adequate and well-controlled studies in pregnant women. BANZEL should be used during pregnancy only if the potential benefit justifies the potential risk to the fetus. Rufinamide produced developmental toxicity when administered orally to pregnant animals at clinically relevant doses. Rufinamide was administered orally to rats at doses of 20, 100, and 300 mg/kg per day and to rabbits at doses of 30, 200, and 1000 mg/kg/day during the period of organogenesis (implantation to closure of the hard palate); the high doses are associated with plasma AUCs ≈2 times the human plasma AUC at the maximum recommended human dose (MRHD, 3200 mg per day). Decreased fetal weights and increased incidences of fetal skeletal abnormalities were observed in rats at doses associated with maternal toxicity. In rabbits, embryo-fetal death, decreased fetal body weights, and increased incidences of fetal visceral and skeletal abnormalities occurred at all but the low dose. The highest dose tested in rabbits was associated with abortion. The no-effect doses for adverse effects on rat and rabbit embryo-fetal development (20 and 30 mg/kg per day, respectively) were associated with plasma AUCs ≈ 0.2 times that in humans at the MRHD. In a rat pre- and post-natal development study (dosing from implantation through weaning) conducted at oral doses of 5, 30, and 150 mg/kg per day (associated with plasma AUCs up to ≈1.5 times that in humans at the MRHD), decreased offspring growth and survival were observed at all doses tested. A no-effect dose for adverse effects on pre- and post-natal development was not established. The lowest dose tested was associated with plasma AUC < 0.1 times that in humans at the MRHD. To provide information regarding the effects of in utero exposure to BANZEL, physicians are advised to recommend that pregnant patients taking BANZEL enroll in the North American Antiepileptic Drug Pregnancy Registry. This can be done by calling the toll free number 1-888-233-2334, and must be done by patients themselves. Information on the registry can also be found at the website http://www.aedpregnancyregistry.org/. Rufinamide is likely to be excreted in human milk. Because of the potential for serious adverse reactions in nursing infants from BANZEL, a decision should be made whether to discontinue nursing or discontinue the drug taking into account the importance of the drug to the mother. Safety and effectiveness have been established in pediatric patients 1 to 17 years of age. The effectiveness of BANZEL in pediatric patients 4 years of age and older was based upon an adequate and well-controlled trial of BANZEL that included both adults and pediatric patients, 4 years of age and older, with Lennox Gastaut Syndrome. The effectiveness in patients 1 to less than 4 years was based upon a bridging pharmacokinetic and safety study [see Dosage and Administration (2.1), Adverse Reactions (6.1), and Clinical Studies (14)]. The pharmacokinetics of rufinamide in the pediatric patients, ages 1 to less than 4 years of age is similar to children older than 4 years of age and adults [see Clinical Pharmacology (12.3)]. Clinical studies of BANZEL did not include sufficient numbers of subjects aged 65 and over to determine whether they respond differently from younger subjects. In general, dose selection for an elderly patient should be cautious, usually starting at the low end of the dosing range, reflecting the greater frequency of decreased hepatic, renal, or cardiac function, and of concomitant disease or other drug therapy. Pharmacokinetics of rufinamide in the elderly are similar to that in the young subjects [see Clinical Pharmacology (12.3)]. Rufinamide pharmacokinetics in patients with severe renal impairment (creatinine clearance < 30 mL/min) was similar to that of healthy subjects. Dose adjustment in patients undergoing dialysis should be considered [see Clinical Pharmacology (12.3)]. Use of BANZEL in patients with severe hepatic impairment (Child-Pugh score 10 to 15) is not recommended. Caution should be exercised in treating patients with mild (Child-Pugh score 5 to 6) to moderate (Child-Pugh score 7 to 9) hepatic impairment. One overdose of 7200 mg per day BANZEL was reported in an adult during the clinical trials. The overdose was associated with no major signs or symptoms, no medical intervention was required, and the patient continued in the study at the target dose. Treatment or Management of Overdose: There is no specific antidote for overdose with BANZEL. If clinically indicated, elimination of unabsorbed drug should be attempted by induction of emesis or gastric lavage. Usual precautions should be observed to maintain the airway. General supportive care of the patient is indicated including monitoring of vital signs and observation of the clinical status of the patient. Hemodialysis: Standard hemodialysis procedures may result in limited clearance of rufinamide. Although there is no experience to date in treating overdose with hemodialysis, the procedure may be considered when indicated by the patient’s clinical state. 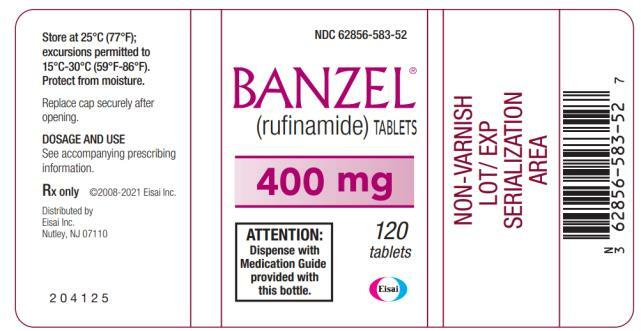 BANZEL (rufinamide) is a triazole derivative structurally unrelated to currently marketed antiepileptic drugs (AEDs). Rufinamide has the chemical name 1-[(2,6-difluorophenyl)methyl]-1H-1,2,3-triazole-4 carboxamide. It has an empirical formula of C10H8F2N4O and a molecular weight of 238.2. The drug substance is a white, crystalline, odorless, and slightly bitter tasting neutral powder. Rufinamide is practically insoluble in water, slightly soluble in tetrahydrofuran and in methanol, and very slightly soluble in ethanol and in acetonitrile. BANZEL is available for oral administration in film-coated tablets, scored on both sides, containing 200 and 400 mg of rufinamide. Inactive ingredients are colloidal silicon dioxide, corn starch crosscarmellose sodium, hypromellose, lactose monohydrate, magnesium stearate, microcrystalline cellulose, and sodium lauryl sulphate. The film coating contains hypromellose, iron oxide red, polyethylene glycol, talc, and titanium dioxide. 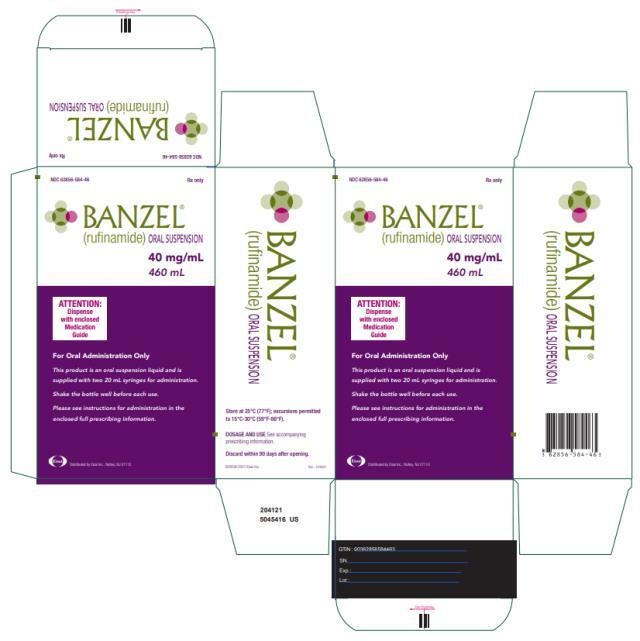 BANZEL is also available for oral administration as a liquid containing rufinamide at a concentration of 40 mg/mL. Inactive ingredients include microcrystalline cellulose and carboxymethylcellulose sodium, hydroxyethylcellulose, anhydrous citric acid, simethicone emulsion 30%, poloxamer 188, methylparaben, propylparaben, propylene glycol, potassium sorbate, noncrystallizing sorbitol solution 70%, and an orange flavor. The results of in vitro studies suggest that the principal mechanism of action of rufinamide is modulation of the activity of sodium channels and, in particular, prolongation of the inactive state of the channel. Rufinamide (≥ 1 μM) significantly slowed sodium channel recovery from inactivation after a prolonged prepulse in cultured cortical neurons, and limited sustained repetitive firing of sodium-dependent action potentials (EC50 of 3.8 μM). BANZEL oral suspension is bioequivalent on a mg per mg basis to BANZEL tablets. BANZEL is well absorbed after oral administration. However, the rate of absorption is relatively slow and the extent of absorption is decreased as dose is increased. The pharmacokinetics does not change with multiple dosing. Most elimination of rufinamide is via metabolism, with the primary metabolite resulting from enzymatic hydrolysis of the carboxamide moiety to form the carboxylic acid. This metabolic route is not cytochrome P450 dependent. There are no known active metabolites. Plasma half-life of rufinamide is approximately 6-10 hours. Following oral administration of BANZEL, peak plasma concentrations occur between 4 and 6 hours (Tmax) both under fed and fasted conditions. BANZEL tablets display decreasing bioavailability with increasing dose after single and multiple dose administration. Based on urinary excretion, the extent of absorption was at least 85% following oral administration of a single dose of 600 mg rufinamide tablet under fed conditions. Food increased the extent of absorption of rufinamide in healthy volunteers by 34% and increased peak exposure by 56% after a single dose of 400 mg tablet, although the Tmax was not elevated [see Dosage and Administration (2.2)]. Only a small fraction of rufinamide (34%) is bound to human serum proteins, predominantly to albumin (27%), giving little risk of displacement drug-drug interactions. Rufinamide was evenly distributed between erythrocytes and plasma. The apparent volume of distribution is dependent upon dose and varies with body surface area. The apparent volume of distribution was about 50 L at 3200 mg per day. Rufinamide did not show any significant inhibition of P-glycoprotein in an invitro study. The plasma elimination half-life is approximately 6-10 hours in healthy subjects and patients with epilepsy. The results of a study evaluating single-dose (400 mg) and multiple dose (800 mg per day for 6 days) pharmacokinetics of rufinamide in 8 healthy elderly subjects (65-80 years old) and 7 younger healthy subjects (18-45 years old) found no significant age-related differences in the pharmacokinetics of rufinamide. Population pharmacokinetic analyses of females show a 6-14% lower apparent clearance of rufinamide compared to males. This effect is not clinically important. Rufinamide pharmacokinetics in 9 patients with severe renal impairment (creatinine clearance < 30 mL per min) was similar to that of healthy subjects. Patients undergoing dialysis 3 hours post rufinamide dosing showed a reduction in AUC and Cmax by 29% and 16%, respectively. Based on in vitro studies, rufinamide shows little or no inhibition of most cytochrome P450 enzymes at clinically relevant concentrations, with weak inhibition of CYP 2E1. Drugs that are substrates of CYP 2E1 (e.g., chlorzoxazone) may have increased plasma levels in the presence of rufinamide, but this has not been studied. Based on a population pharmacokinetic analysis, rufinamide clearance was decreased by valproate. In pediatric patients, valproate administration may lead to elevated levels of rufinamide by up to 70% [see Drug Interactions (7.2)]. Co-administration and pre-treatment of BANZEL (400 mg twice daily) and triazolam resulted in a 37% decrease in AUC and a 23% decrease in Cmax of triazolam, a CYP 3A4 substrate. Co-administration of BANZEL (800 mg twice daily for 14 days) and Ortho-Novum 1/35® resulted in a mean decrease in the ethinyl estradiol AUC0-24 of 22% and Cmax by 31% and norethindrone AUC0-24 by 14% and Cmax by 18%, respectively. The clinical significance of this decrease is unknown [see Drug Interactions (7.3)]. Rufinamide was given in the diet to mice at 40, 120, and 400 mg/kg per day and to rats at 20, 60, and 200 mg/kg per day for 2 years. The doses in mice were associated with plasma AUCs 0.1 to 1 times the human plasma AUC at the maximum recommended human dose (MRHD, 3200 mg/day). Increased incidences of tumors (benign bone tumors (osteomas) and/or hepatocellular adenomas and carcinomas) were observed in mice at all doses. Increased incidences of thyroid follicular adenomas were observed in rats at all but the low dose; the low dose is < 0.1 times the MRHD on a mg/m2 basis. Oral administration of rufinamide (doses of 20, 60, 200, and 600 mg/kg per day) to male and female rats prior to mating and throughout mating, and continuing in females up to day 6 of gestation resulted in impairment of fertility (decreased conception rates and mating and fertility indices; decreased numbers of corpora lutea, implantations, and live embryos; increased preimplantation loss; decreased sperm count and motility) at all doses tested. Therefore, a no-effect dose was not established. The lowest dose tested was associated with a plasma AUC ≈ 0.2 times the human plasma AUC at the MRHD. The effectiveness of BANZEL as adjunctive treatment for the seizures associated with Lennox-Gastaut Syndrome (LGS) in adult and pediatric patients ages 4 years and older was established in a single multicenter, double-blind, placebo-controlled, randomized, parallel-group study (N=138). Male and female patients (between 4 and 30 years of age) were included if they had a diagnosis of inadequately controlled seizures associated with LGS (including both atypical absence seizures and drop attacks) and were being treated with 1 to 3 concomitant stable dose AEDs. Each patient must have had at least 90 seizures in the month prior to study entry. After completing a 4-week Baseline Phase on stable therapy, patients were randomized to have BANZEL or placebo added to their ongoing therapy during the 12 -week Double-blind Phase. The Double-blind Phase consisted of 2 periods: the Titration Period (1 to 2 weeks) and the Maintenance Period (10 weeks). During the Titration Period, the dose was increased to a target dosage of approximately 45 mg/kg per day (3200 mg in adults of > 70 kg), given on a twice daily schedule. Dosage reductions were permitted during titration if problems in tolerability were encountered. Final doses at titration were to remain stable during the maintenance period. Target dosage was achieved in 88% of the BANZEL-treated patients. The majority of these patients reached the target dose within 7 days, with the remaining patients achieving the target dose within 14 days. Seizure severity from the Parent/Guardian Global Evaluation of the patient’s condition. This was a 7-point assessment performed at the end of the Double-blind Phase. A score of +3 indicated that the patient’s seizure severity was very much improved, a score of 0 that the seizure severity was unchanged, and a score of -3 that the seizure severity was very much worse. The effectiveness of BANZEL as adjunctive treatment for the seizures associated with Lennox-Gastaut Syndrome in pediatric patients ages 1 year to less than 4 years was established based on a single multi-center, open-label, active-controlled, randomized, pharmacokinetic bridging study. The pharmacokinetic profile of BANZEL is not significantly affected by age either as a continuous covariate (1 to 35 years) or as a categorical covariate (age categories: 1 to less than 4 years and 4 years of age and older), after body weight is taken into consideration. 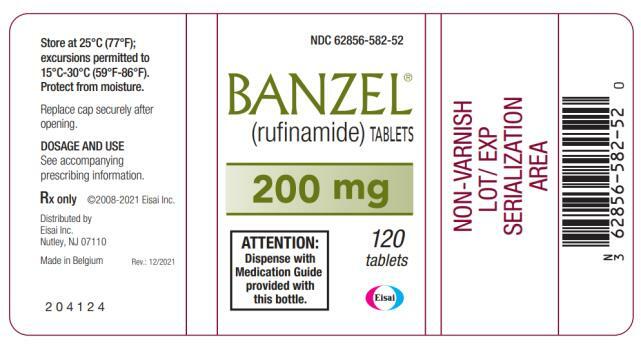 BANZEL 200 mg tablets (containing 200 mg rufinamide) are pink in color, film-coated, oblong-shape tablets, with a score on both sides, imprinted with “ 262” on one side. They are available in bottles of 120 (NDC 62856-582-52). BANZEL 400 mg tablets (containing 400 mg rufinamide) are pink in color, film-coated, oblong-shape tablets, with a score on both sides, imprinted with “ 263” on one side. They are available in bottles of 120 (NDC 62856-583-52). BANZEL oral suspension is an orange flavored liquid supplied in a polyethylene terephthalate (PET) bottle with child-resistant closure. The oral suspension is packaged with a dispenser set which contains a calibrated oral dosing syringe and an adapter. Store the oral suspension in an upright position. Use within 90 days of first opening the bottle, then discard any remainder. The oral suspension is available in bottles of 460 mL (NDC 62856-584-46). Store the tablets at 25ºC (77ºF); excursions permitted to 15º- 30ºC (59ºF - 86ºF). Protect from moisture. Replace cap securely after opening. Store the oral suspension at 25ºC (77ºF); excursions permitted to 15º- 30ºC (59ºF - 86ºF). Replace cap securely after opening. The cap fits properly in place when the adapter is in place. Advise patients to take BANZEL with food [see Dosage and Administration (2.2)]. 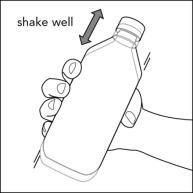 Advise patients who are prescribed the oral suspension to shake the bottle vigorously before every administration and to use the adaptor and oral dosing syringe [see Dosage and Administration (2.2)]. Inform patients, their caregivers, and families that antiepileptic drugs increase the risk of suicidal thoughts and behavior and should be advised of the need to be alert for the emergence or worsening of the signs and symptoms of depression, any unusual changes in mood or behavior, or the emergence of suicidal thoughts, behavior, or thoughts about self-harm. Behaviors of concern should be reported immediately to healthcare providers [see Warnings and Precautions (5.1)]. Inform patients about the potential for somnolence or dizziness and advise them not to drive or operate machinery until they have gained sufficient experience on BANZEL to gauge whether it adversely affects their mental and/or motor performance [see Warnings and Precautions (5.2)]. Advise patients to notify their physician if they experience a rash associated with fever [see Warnings and Precautions (5.4)]. Inform female patients of childbearing age that the concurrent use of BANZEL with hormonal contraceptives may render this method of contraception less effective. Recommend patients use additional non-hormonal forms of contraception when using BANZEL [see Drug Interactions (7.3)]. Inform patients that alcohol in combination with BANZEL may cause additive central nervous system effects. Advise patients to notify their physician if they become pregnant or intend to become pregnant during therapy. Encourage patients to enroll in the North American Antiepileptic Drug Pregnancy Registry if they become pregnant. To enroll, patients can call the toll free number 1-888-233-2334 [see Use in Specific Populations (8.1)]. Advise patients to notify their physician if they are breast-feeding or intend to breast-feed [see Use in Specific Populations (8.3)]. Read this Medication Guide before you start taking BANZEL and each time you get a refill. There may be new information. This information does not take the place of talking to your healthcare provider about your medical condition or treatment. What is the most important information I should know about BANZEL? Do not stop taking BANZEL without first talking to your healthcare provider. Stopping BANZEL suddenly can cause serious problems. 1. Like other antiepileptic drugs, BANZEL may cause suicidal thoughts or actions in a very small number of people, about 1 in 500. Do not stop BANZEL without first talking to a healthcare provider. Stopping BANZEL suddenly can cause serious problems. Stopping a seizure medicine suddenly in a patient who has epilepsy can cause seizures that will not stop (status epilepticus). 2. BANZEL may cause you to feel sleepy, tired, weak, dizzy, or have problems with coordination and walking. BANZEL is a prescription medicine used with other medicines to treat seizures associated with Lennox-Gastaut Syndrome (LGS) in adults and pediatric patients 1 year of age and older. It is not known if BANZEL is safe and effective in the treatment of Lennox-Gastaut Syndrome in pediatric patients under 1 year of age. Who should not take BANZEL? Do not take BANZEL if you have a genetic condition called familial short QT syndrome, a problem that affects the electrical system of the heart. What should I tell my healthcare provider before taking BANZEL? are pregnant or plan to become pregnant. It is not known if BANZEL can harm your unborn baby. Tell your healthcare provider right away if you become pregnant while taking BANZEL. You and your healthcare provider will decide if you should take BANZEL while you are pregnant. BANZEL may make certain types of birth control less effective. Talk to your healthcare provider about the best birth control methods for you while you take BANZEL. ○ If you become pregnant while taking BANZEL, talk to your healthcare provider about registering with the North American Antiepileptic Drug Pregnancy Registry. You can enroll in this registry by calling 1-888-233-2334. The purpose of this registry is to collect information about the safety of antiepileptic medicines during pregnancy. are breastfeeding or plan to breastfeed. BANZEL may pass into your breast milk. You and your healthcare provider should decide if you will take BANZEL or breastfeed. You should not do both. Taking BANZEL with certain other medicines can cause side effects or affect how well they work. Do not start or stop other medicines without talking to your healthcare provider. How should I take BANZEL? Take BANZEL exactly as your healthcare provider tells you. Your healthcare provider will tell you how much BANZEL to take. Your healthcare provider may change your dose. Do not change your dose of BANZEL without talking to your healthcare provider. BANZEL tablets can be swallowed whole, cut in half or crushed. 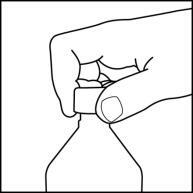 If you take BANZEL Oral Suspension instead of BANZEL tablets, shake the bottle well before you take each dose. 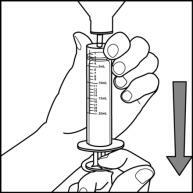 Measure your dose of BANZEL Oral Suspension using the bottle adapter and dosing syringes provided. 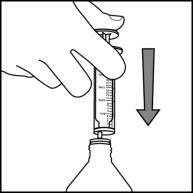 See the complete Instructions for Use below for information on how to use the dosing syringes and measure your dose of BANZEL Oral Suspension. If you take too much BANZEL, call your local Poison Control Center or get emergency medical help right away. What should I avoid while taking BANZEL? Do not drink alcohol or take other medicines that make you sleepy or dizzy while taking BANZEL until you talk to your healthcare provider. BANZEL taken with alcohol or medicines that cause sleepiness or dizziness may make your sleepiness or dizziness worse. What are the possible side effects of BANZEL? BANZEL can also cause allergic reactions or serious problems which may affect organs and other parts of your body like the liver or blood cells. You may or may not have a rash with these types of reactions. Tell your healthcare provider about any side effect that bothers you or that does not go away. These are not all of the possible side effects of BANZEL. For more information, ask your healthcare provider or pharmacist. How should I store BANZEL? Store BANZEL tablets and oral suspension at 59ºF to 86ºF (15ºC to 30ºC). Keep BANZEL tablets in a dry place. Keep BANZEL Oral Suspension in an upright position. Use BANZEL Oral Suspension within 90 days of first opening the bottle. Keep BANZEL and all medicines out of the reach of children. Medicines are sometimes prescribed for purposes other than those listed in a Medication Guide. Do not use BANZEL for a condition for which it was not prescribed. Do not give BANZEL to other people, even if they have the same symptoms that you have. It may harm them. This Medication Guide summarizes the most important information about BANZEL. If you would like more information, talk with your doctor. You can ask your pharmacist or doctor for information about BANZEL that is written for health professionals. For more information, go to www.banzel.com or call 1-888-274-2378. What are the ingredients in BANZEL? Inactive ingredients: colloidal silicon dioxide, corn starch crosscarmellose sodium, hypromellose, lactose monohydrate, magnesium stearate, microcrystalline cellulose, and sodium lauryl sulphate, iron oxide red, polyethylene glycol, talc, and titanium dioxide. Inactive ingredients: microcrystalline cellulose and carboxymethylcellulose sodium, hydroxyethylcellulose, anhydrous citric acid, simethicone emulsion 30%, poloxamer 188, methylparaben, propylparaben, propylene glycol, potassium sorbate, noncrystallizing sorbitol solution 70%, orange flavor. The oral suspension does not contain lactose or gluten and is dye-free. The oral suspension does contain carbohydrates. 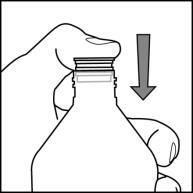 Read the Instructions for Use before using BANZEL Oral Suspension and each time you get a refill. There may be new information. This leaflet does not take the place of talking with the doctor about your medical condition or treatment. Your total daily dose of BANZEL Oral Suspension is______mL. Note: The doctor may change your dose, especially when you are first starting BANZEL Oral Suspension. If your dose is 30 mL, draw up 20 mL in the first syringe and the remaining 10 mL in the second syringe. 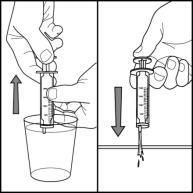 If your dose is 30 mL, draw up 20 mL in the single syringe and squirt the medicine into your mouth, then draw up the remaining 10 mL in that same syringe. Repeat Steps 4 through 6 when drawing up the remaining dose of medicine, if your dose is more than 20 mL. Step 8. Remove the syringe from the bottle adapter.